Berkshire Township dedicated its first community park during a ribbon-cutting ceremony Sunday. Township officials said they are proud to be one of the first recipients of this project sponsored by the United Way of Delaware County and the Women’s Leadership Network of United Way. 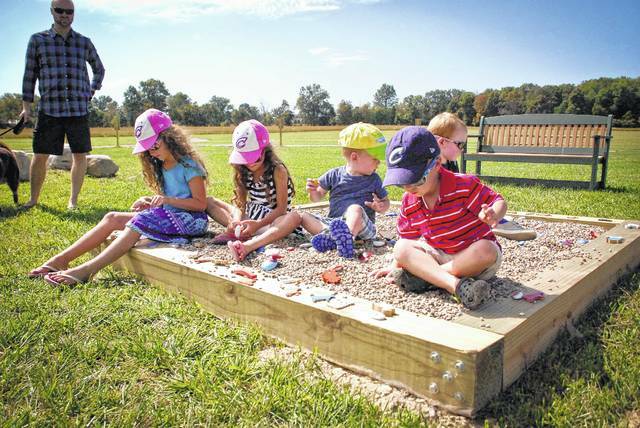 “It’s the township’s first park,” said Shawna Burkham, assistant township administrator. She said there were other parks in the township created by the Home Owner Associations, but this was the first official park for the township. The park is located across the parking lot from the township hall at 1454 Rome Corners Road. According to Burkham, more than 150 people enjoyed a fun afternoon of play, refreshments, and special events at the Pollinator Learning Garden, sponsored in part by the Delaware County Master Gardeners. Burkham said the trails and park were created to help parents of young children connect with their kids in fun and educational ways. Big Walnut High School’s National Art Honor Society created the many unique, custom artworks to decorate the trail. “It was nice to giving stuff to the community,” said Emma Brinkerhoff, one of the members of the honor society. Burkham said the centerpiece of the park is a natural play area for small children. On Sunday, several children filled the sandbox, laughing and giggling as they discovered the many hidden treasures buried underneath the rocks and sand. Children also had the opportunity to interact with mounted officers from the Delaware County Sheriff’s Office and to see and touch emergency equipment up close. Burkham said the Delaware campus of the Columbus State Community College dug holes and installed trail signs as part of their 2017 Day of Service. Burkham said the township would like to thank all the BTS&G Fire Department, Delaware General Health District and the Girl Scouts of America for participating in the event. The Born Learning Trails of the park were created by United Way so children can experience nature hands on. Children were drawn to the large box of sand and rocks where they could dig to find hand painted rocks with wonderful designs that will help them about nature with their parents. 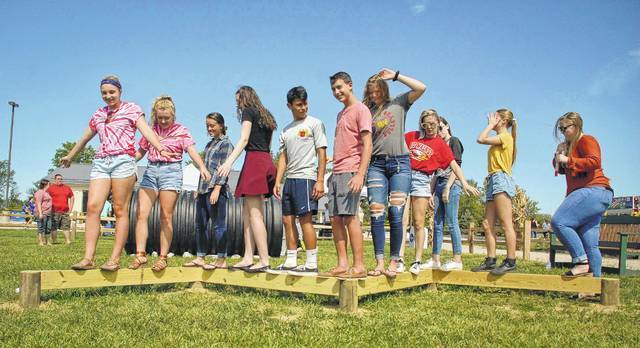 Big Walnut High School’s National Art Honor Society are credited with designing the many pieces of art lining Born Learning Trail in the township’s new park. As a group before the dedication started they decided to take a walk along the zig-zag balance beam. This entry was tagged Berkshire Township, Learning Trail, Park. Bookmark the permalink.